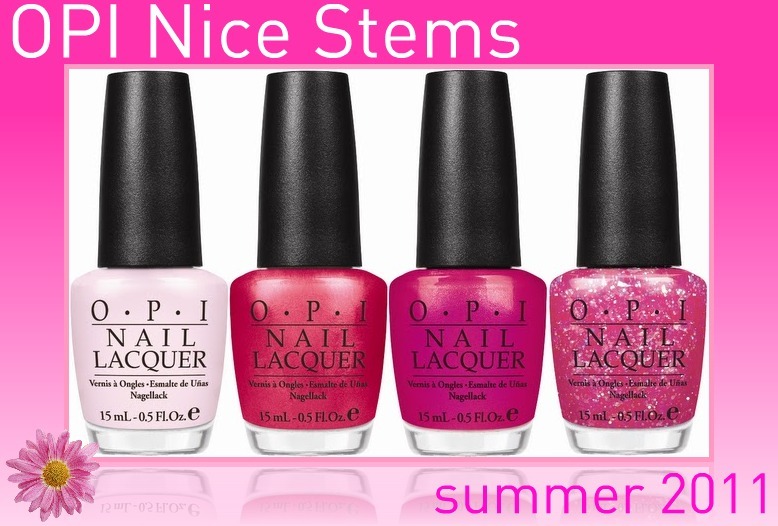 May's monthly contest features the OPI Summer Collection, Nice Stems. This 4 piece set contains four shades of pinks, including a glitter top coat. The shades from L-R: Play the Peonies, Come to Poppy, Be a Dahlia Won't You?, and I Lily Love You. If you'd like to enter, send me an eMail (mej0620@hotmail.com) with the words "Nice Stems" as the subject line. Please include your first name and last name, or at least your last name initial. There will be two winners, and each will receive a complete set. Contest ends 5/27/11 at midnight, and the winners will be announced Monday, May 30 in my Come Monday weekly newsletter. Note: These have an expected June release date. Followers only, please. nice giveaway those need a good home..MINE!!!! thanks for this chance at them. love this giveaway Hopefully I'll get LUCKY!!! These would be so great to have, love pinks! I also added your contest to my Giveaways page! They look so pretty! Thanks for a chance to win them! Done and done :) I can't wait to get my hands on I Lily Love You! Very posh giveaway! :) i emailed and followed you on twitter! What a great giveaway!! Thank you! !